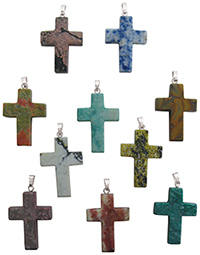 Item #IGM-CRS-15: Lot of ten 18x25mm assorted Gemstone cross pendants with silver-tone bails. 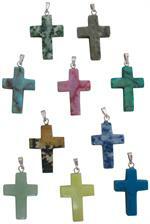 Lots vary and may include assorted natural and dyed Jaspers, Agates, Quartz, Howlite and other materials. Item #TM-E09-NP2446: 18" 14Kt. Yellow Gold Cross necklace with one round and five baguette Diamonds of .20 Cts. TW. Item #ARS-PD1752: 14Kt. 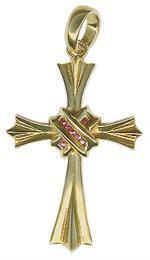 Yellow Gold Cross pendant with round and baquette Diamonds of .25 Cts. set in White Gold. Item #SBC-53856P-GAM: Samuel B. 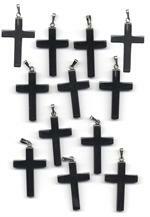 Collection Sterling Silver cross pendant with 8mm cushion Prasiolite and 18Kt. Yellow Gold accents. 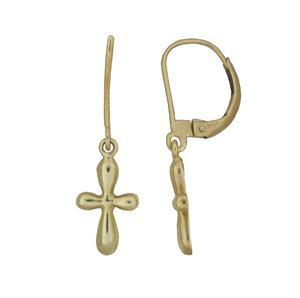 Item #TBM-30838: 18" 14Kt. White Gold cross necklace with round Rubies of .50 Cts. TW and round Diamonds of .16 Cts. TW.